Seasons greetings from the PLATFORM office! 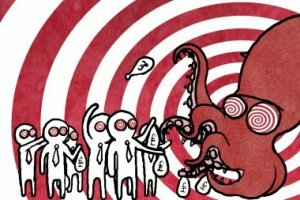 In this newsletter, we have a couple of suggestions of things that we have recently produced that would make nice, political Christmas prezzies, details of a new report on offshore oil drilling, an account of the ‘privilege training’ that we undertook in Autumn, and a short video about a giant vampire squid. Throughout 2010, a series of performance interventions took place in gallery spaces over the issue of oil-sponsorship of the arts. This collection of beautiful postcards, made in collaboration with PLATFORM and Art Not Oil, documents both the striking images that the performances have generated, as well as a number of choice quotes that have come out of the ensuing public debate. There are less than two weeks left of our crowd-funding drive to get the money to host a participatory exhibition/event in 2011 in which we hope to take the issue of oil sponsorship of the arts to the next level. We will send one (or more) of the postcard packs to anyone who can make a donation on www.indiegogo.com/licencetospill We have just one week left to make the final $800 of our crowdfunding target. PLATFORM and African Writers Abroad present 19 poets and 29 poems in a new volume crackling with acute observation and arresting calls to justice. The collection features powerful new work from acclaimed performance-poets Simon Murray (Sai Murai) and Dorothea Smartt, commissioned during PLATFORM’s 2009 season at Arnolfini: C Words: Carbon, Climate, Capital, Culture . It republishes selected work by Helon Habila, Sue Richardson, Davd Eggleton,Tolu Ogunlesi, Carmen Borja, and features major Bristol poets Ros Martin and Edson Burton. There’s fresh exciting work from participants in C Words creative writing workshops run by Simon and Dorothea, and the volume ends with a compelling piece by Zena Edwards. No Condition is Permanent balms the soul, galvanises the spirit, and stirs up hope and action. This anthology costs £4. You can pay us directly via paypal (email [email protected]) or send a cheque to the office. More governments are approving drilling in deeper, riskier, more ecologically sensitive environments. They justify this through the mantra of “energy security”. The search for “new” oil supplies has come to dominate policy agendas, at the expense of cleaner, alternative energy sources. The heavy bias towards fossil fuels undermines government policies to address global climate change and to meet renewable energy targets. This PLATFORM report provides in-depth analysis of these trends and alerts policy makers to the environmental and safety concerns around present and planned offshore drilling in the UK North Sea and the Falklands Islands. It exposes significant capacity shortfalls in government inspection agencies and highlights key areas where better regulatory oversight is urgently required to prevent future disasters. Download the report here. Power and privilege training has become commonplace in US social justice activism over the past decade as an integral part of making real and lasting change. From meetings dominated by speakers with male privilege, to networks dominated by middle class people with white privilege, looking at how privilege operates in our social interactions is a useful step towards shifting social relations. In Autumn, PLATFORM had an initial session that tried to grapple with some of these issues. You can read more about the session we had, read some of the texts that influenced us, and download the exercises that used here. The New Economics Foundation has just launched a new animation as part of it’s Great Transition campaign with the support of PLATFORM. Launched to mark the start of bank bonus season, it ask politicians whether they have a plan to tame the bank, and if not, why not? You can watch the short animation of the vampire squid here. PLATFORM is on Facebook. You can join the group here.